Here are some sprankles for your Monday! I made these forever ago, but saved them for a rainy day. I was in Ohio all weekend (one of my awesome friends from college got married!) and knew I’d need a blog post to start off the week. These cupcakes are super easy to make. I had never made hi-hat anything before this Neapolitan Hi-Hat Cake from I am Baker‘s cookbook, Surprise-Inside Cakes. I loved making that cake. It was one of those recipes that made me smile the whole time I was making it, and especially when it turned out decently! So I decided to make some actual hi-hat cupcakes. For the cake, you can go box mix or use a homemade funfetti recipe. 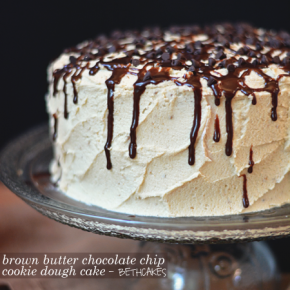 I tried this with both, and they turned out wonderfully and sprinkle-filled. 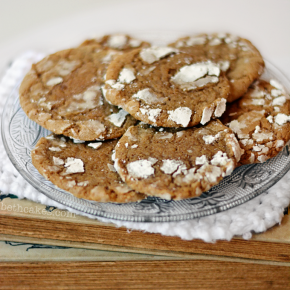 If you’re looking for a great homemade recipe, this one from Sweetapolita is the real deal. I sort of cut it in half so I would only have 12ish cupcakes, but the whole thing will make about 24. Maybe a couple extras. For snacking. Then comes the super fun part. 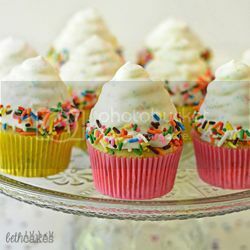 I think most hi-hat cupcakes use a marshmallow frosting, but the hi-hat cake called for Cool Whip. I wanted to take a “so easy anyone can do it!” approach to these, so I stuck with Cool Whip. I go to Michael’s and Hobby Lobby a lot. When I was in college, the register lady at Michael’s would see me walk in and be like, “Oh, you’re making another cake!” True story. In the little bins of candy melts, I’ve always thought the speckled, ColorBurst Candy Melts are so cute! Which is the other place the inspiration for these cupcakes came from. I just really wanted to come up with a way to use them. Make and bake cupcakes according to box or recipe instructions. Cool completely before frosting! Once the cupcakes are cool, transfer the Cool Whip (You'll need the big 16oz container) to a piping bag with a large round decorating tip, or simply with the end snipped off. Pipe the Cool Whip on the cupcake by starting with a large circle. Fill in the circle and smooth it over with a knife. Then pipe a slightly smaller circle on top of that and fill it in. Repeat one or two more times. Transfer the cupcakes to the freezer and let them freezer for at least 3-4 hours. Overnight is best, just to make sure they're completely solid. Once the cupcakes are nice and frozen, take them out of the freezer one at a time for dipping. Holding the cupcake upside down, dip it into the coating until the Cool Whip is completely covered. Then lift it out of the coating and let the access drip off. Immediately sprinkle the bottom rim with sprinkles. If they start to slide off, wait another minute to let the coating harden slightly. Put the cupcake back in the freezer and move onto the next one! Repeat with all the cupcakes. Store cupcakes covered in the freezer (I didn't try the refrigerator, but you could try that.) Let them thaw for a few minutes before serving. All images and content are copyright protected. Please do not use my images without permission. If you would like to republish this post, please just link back to it. Thank you! And, because I love you guys, I’ve teamed up with some of my awesome blog friends for a really fun Nielsen-Massey giveaway! Seriously, this is a good one, y’all. Pretty much all the extracts of your dreams. To enter, just fill out the form below! Check out these posts by the other bloggers in this giveaway! I love these cupcakes!! They’re absolutely adorable, and I love all the sprinkles everrrywhere 😀 Pinned! Beautiful!!!! 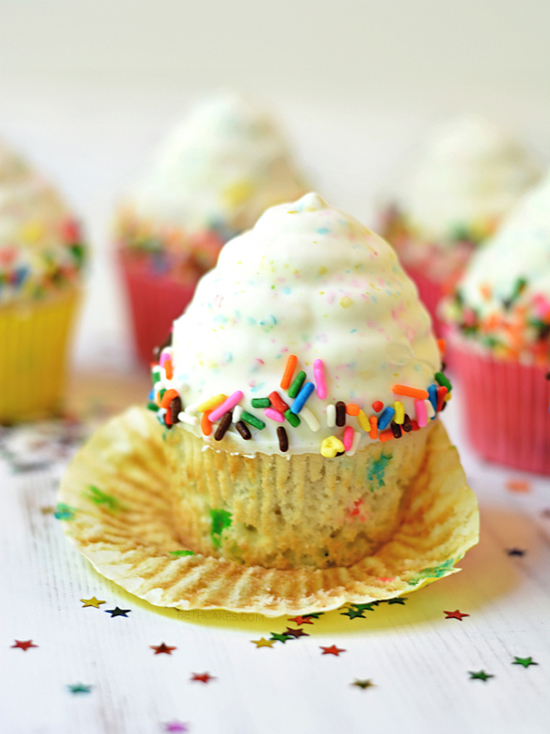 I love funfetti cupcakes ready but topping with a hat takes them to a whole new level! 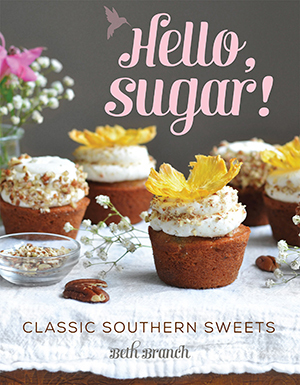 I’ve always wanted to bake hi-hat cupcakes. . love these! so fun and look soooo good!!! These look almost too cute to eat – almost……. Pingback: Simply Perfect Vanilla Ice Cream, & a Giveaway! I am unfamiliar with the hi hat concept. So thanx for the education! Perfect choice for using funfetti! Kids just go wild with this cup cake style—big and little kids. Ha! These are awesome! I have been on a hi-hat cupcake kick lately–just need to actually make a batch for the blog. 🙂 But I love them an I love your cool whip/funfetti twist! 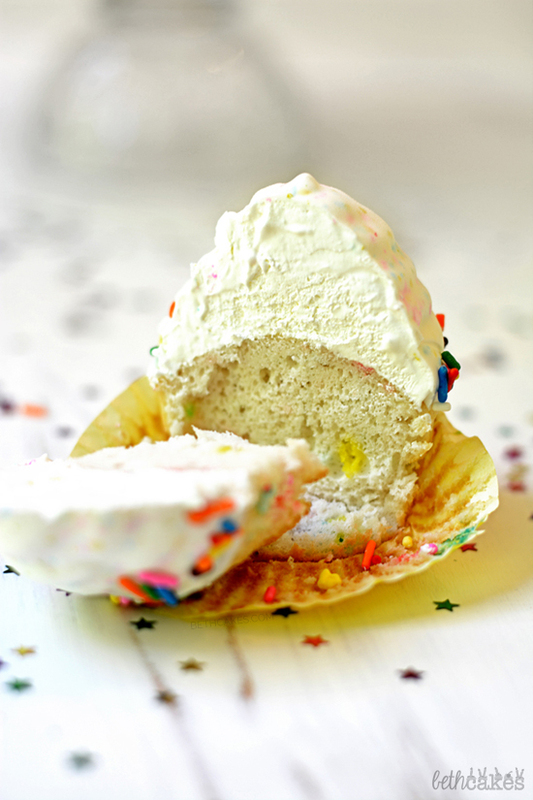 I always see those funfetti melts but have never tried them before–this is the perfect use for them. 🙂 Fantastic giveaway as well! 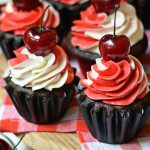 I love high hat cupcakes – these look so sweet!! These are an amazing twist on hi-hat cupcakes! Seriously, amazing job Beth! 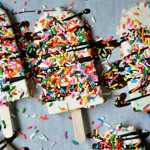 Sprinkles are definitely the best way to cure Monday blues!! I love these cupcakes – they are seriously so fun! 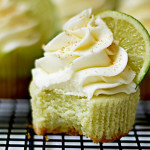 I only recently discovered hi-hat cupcakes, but I’m dying to make them now!! They are so awesome! Oh wow these are gorgeous! Hi-hat cupcakes are so cool. 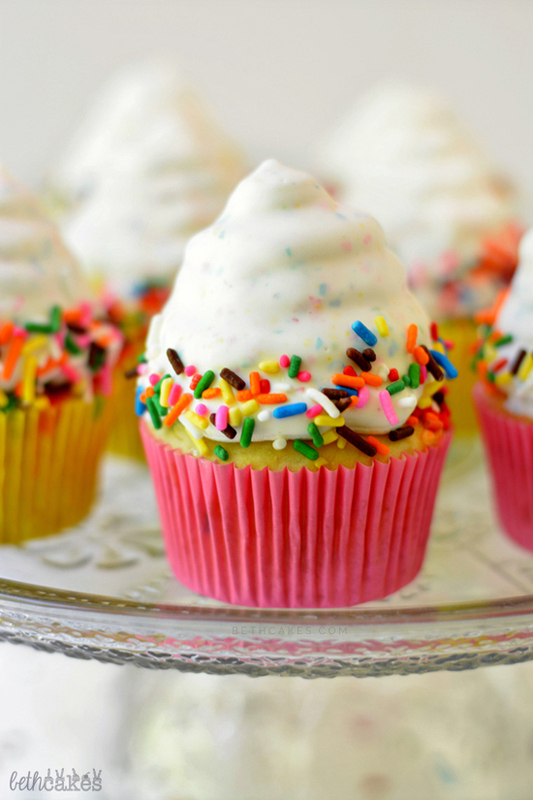 Cupcakes look delicious and that frosting is so on point! The hi-hats are SO cute! And what a genious idea of how to use those candy melts! 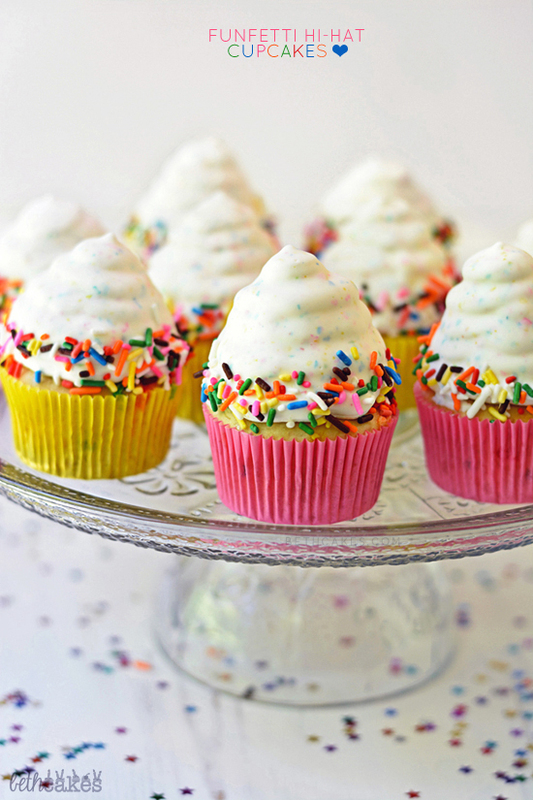 omg hi hat cupcakes are so adorable and I’ve never seen funfetti ones! I MUST HAVE THEM!! 😀 Also, super awesome giveaway! I’m hosting one too this week so be sure to enter if you haven’t (there’s a cool grill involved!) ! Oh girl, I totally entered your giveaway! Haha. 🙂 Totally want that mini grill! You’re a genius to use the Cool Whip!!! And to freeze them. I think I love you! And the photos – OMG. Can I have one for breakfast please??? Love these hi hat cupcakes! 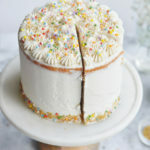 And the addition of the funfetti cake is so perfect and fun! I can never turn down a cupcake and would love one of these for lunch! Bring on the sprinkles! So adorable! I haven’t made hi hat cupcakes yet, because I thought that a large amount of frosting would be a sugar overload for the kiddos. 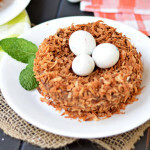 So, your option of using cool whip is perfect, and super easy! Thanks so much for sharing Beth! These are too cute! Yum and yum! Beth, these are so beautiful! I am of the school of thought that you can never, ever have too many sprinkles in a dessert and i’m glad you share that belief!